IDC predicts a 25 percent surge in cloud spending (software, services and infrastructure) this year, reaching more than $100 billion. With applications that contain sensitive information, such as financial or regulated data, moving to the cloud will require special considerations. Companies in the financial, healthcare, or other regulated industries are also aware that they must satisfy regulations and regulators, and they must meet these standards in an environment that is often subject to government surveillance and data center hijackers. These concerns can make the private cloud a more realistic option for companies that want data sovereignty, in which they can secure critical data internally, without exposing it through widely available public interfaces that characterize the public cloud environment. 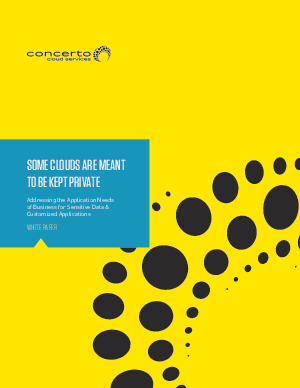 Download this whitepaper to see why a private cloud offers the most secure way to more quickly deliver agile and updated applications. Coupled with the right provider that invests in security and utilizes the most recent technology advances, businesses can realize significant opportunities to save time, resources and money – all while reducing risk.